« Day 200 in Beijing: Not in Beijing. Day 201 in Beijing: Otak-Otak It Is! I guess, when you get down to it, meat is meat. 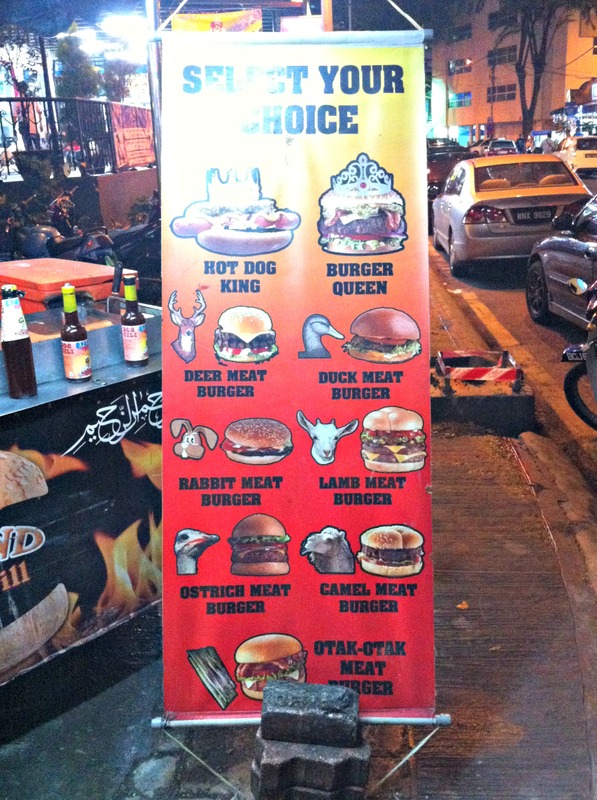 Jill and I were walking down the street here in Kuala Lumpur and checking out the food stalls. There is a lot of street food and we feel much more secure eating it here than in China. Maybe we shouldn’t judge but it is hard not to when you hear the horror stories of the re-used oil back in China and how many people have gotten sick after trying street food there. I’m adventurous but there are certain things I just won’t do. We actually ended up not eating here because we saw an Malaysian restaurant across the street that looked like it would be worth trying and it was. That being said, we really are interested in trying out some of the burgers that this little street food merchant has for sale. I’ve always like deer and ostrich but I’m not sure about camel. 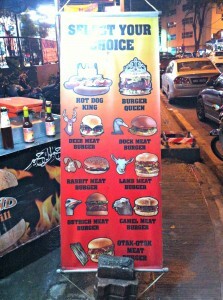 I’m not sure why camel sounds strange to me since meat is meat but it seems weird. Just my Western sensibilities and dogma getting in the way of my taste buds. I also need to ask why the hot dog is king and the hamburger is only a queen. I’m almost afraid to know the answer. By the way, we were a little concerned as to what Otak-Otak was since there is no animal we know of named Otak-Otak. It actually sounds quite delicious and probably is something we will try in the near future since I’m a huge fan of fish patties combined with spices. Yummy!